Our downtown location provides you with a central hub to distribute your brochures, promotional flyers, and business cards. Our staff is available to refer and recommend your business and we ONLY refer Chamber members. Many great referrals are available to businesses who are looking to hire new employees. We also welcome foot traffic for those who are looking for leads. Our staff will help you plan, promote, and execute your ribbon cutting. The Chamber will send out press releases, provide ceremonial scissors and ribbon, present you with a commemorative certificate, and photograph of the event. All of these services are included with your membership. Click here for a printable benefits guide. As a member, you will not only be listed on our online membership directory, but you will also be showcased with your own user-friendly informational page. Upload information, pictures, specials, discounts, and coupons to display information how YOU want it presented! Other website benefits include a direct link to your website and access to job postings, a calendar of events, business resources, a members only section with educational programs, activities, and economic development tools. The Chamber showcases members in our Member Spotlight program each week. Market your business through cost-effective, members-only advertising in the Chamber Compass newsletter, our member directory, area map, PCACC member page of the Lake Erie Shores & Islands Travel Planner, website ads, and through co-ops at Chamber events. Marketing materials are showcased at Ohio turnpike plazas. The Chamber of Commerce works diligently to promote members by representing them at several shows, exhibits, and at the CMP/NRA National Rifle Matches. Also, at the shows attended by the Chamber and Visitor’s Bureau, approximately 100,000 potential customers are exposed to our member-only promotional pieces! Member promotional pieces can be sent across the United States when requested by visitors. The Chamber has organized discounted rates for worker’s compensation, Anthem health insurance, FedEx shipping, and bulk US mail. The mail service alone, offered on 250 pieces or more, can save a member up to $.19 per letter and $220 a year for a bulk mail permit! Also, the Chamber’s Energy Solution Program helps member business to manage their natural gas and electric costs. New this year is our Lunch and Learn series where guest speakers focus on topics that are relevant to our membership, the local area or economic factors. Workshops with various organizations and agencies are also available to Chamber members. Many are provided at no cost to Chamber members. Business After Hours are fun events with plenty of networking, and are open to Chamber members only. Tours, appetizers, drinks, a 50/50 raffle, and door prizes are standard at each event. The Chamber hosts an Annual Dinner to recognize those businesses and individuals that have positively contributed to our community. Our Speed Networking, New Member Orientation and Holiday Mixer events offer additional networking opportunities in an exciting atmosphere. Members are given a FREE discount card giving them access to over 40 local business discounts. This program offers businesses a FREE way to promote their business to other Chamber members. Click here for a printable discount card. The Chamber Compass is a newsletter that includes updates on Chamber events and news that affects local businesses. Two annual hard copy newsletters are mailed to over 1800 Chamber members and area businesses. digital newsletters are e-mailed to the membership throughout the year. Advertising opportunities are available, and all digital ads are linked to the business’ website, e-mail, or social site. A survey of 2,000 adults conducted by the Shapiro Group found that 63% of consumers are more likely to purchase goods or services from a company if they are a member of the Chamber of Commerce. membership in a chamber also increases a company's local reputation by 57%. Our staff works diligently to keep up with the ever-changing business climate. New laws and regulations can be confusing, so the Chamber works hard to pass on helpful and accurate information. Whether researching economic development tools, communicating changes in legislation, or referring available business resources, the Chamber always strives to improve the county's economic climate. Main Street Port Clinton and the Chamber of Commerce have worked together to provide a booklet outlining all the necessary steps to start or grow your business in the Port Clinton area. Applicable Member contact information is included. 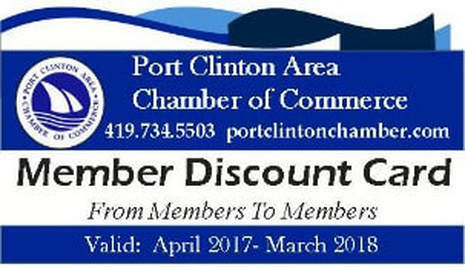 As a member of the PC Chamber, you are supporter of Main Street Port Clinton, a non-profit striving to revitalize our historic downtown. The Chamber and Main Street Port Clinton have various committees in which our members are invited to participate. We value the diversity in our community and strive to represent that in our committees. Volunteers can participate in economic restructuring, downtown Port Clinton promotion, downtown design, Chamber benefits, Chamber communications, or a variety of event committees. The Chamber Foundation provides a scholarship each year to a local area student who is attending college.This non-profit organization also acts as an umbrella organization for other non-profits.